For a year that started out in such a diabolical fashion with record January rainfall in the Hunter, things sure took a turn for the better in the months that followed. 2016 would prove to be our most successful year on the wine show circuit, with our small portfolio of wines collecting no fewer than five GOLD and, another five, SILVER medals. No doubt, the shining star amongst the range was our 2016 The Chase Semillon. This wine claimed three of the five GOLD medals, including a TOP GOLD at the National Wine Show, against the “best of the best” 2016 Semillons. The success of this wine wouldn’t be limited to just the show circuit, as it would go on to feature in glowing reviews by John Lewis, Campbell Mattinson, and Andrew Graham, before achieving arguably its greatest accolade by being included in James Halliday’s highly coveted Top 100 Wines for 2016, with an impressive 96-point rating. The Chase Semillon was one of the stars of 2016, collecting three gold medals and receiving rave reviews! GOLD medal success for our 2015 Hilltops Shiraz No.1 and No.2, confirmed our expansion into the Hilltops region as being a positive one, and these wines also received some great reviews throughout the year, including an impressive 94 points from Campbell Mattinson for our No.2 release on Winefront. Our hope of delivering on arguably Canberra’s greatest vintage, has also been gratified by a flow of kind words and scores for our 2015 Marksman’s Shiraz. Our flagship red received praise from Campbell Mattinson and Andrew Graham, before featuring in Huon Hooke’s Real Review newsletter and website, with a cracking review and 94 point rating only a few weeks ago. It’s also very encouraging to see favourable reviews for our more innovative wines. In June 2016, Gundog Estate joined just three other Hunter Valley based wineries in Matthew Jukes’ 100 Best Australian Wines for 2016 / 17. 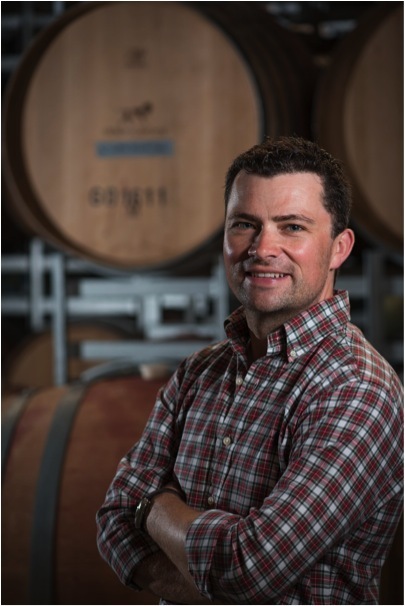 Matthew is one of the UK’s leading wine writers, and considered an authority on Australian wine. He loved the unique style of our 2015 Wild Semillon, remarking on it’s lightness of touch, “tantalising tisane scent,” and claims to have been “knocked sideways by this seductress...!” A more recent acknowledgement for our innovation with Semillon came just recently with an article on minimal intervention winemaking by James Halliday in the Weekend Australian Magazine. Halliday rated our 2015 Indomitus Albus an incredible 95 points, and praised its freshness, despite the alternative winemaking techniques which we employed. The best way to stay abreast of our current reviews and awards is by following Gundog Estate on Instagram, Facebook, or Twitter , and checking out the WINES page of our website, http://gundogestate.com.au/wines. Cheers to a brilliant year, and thanks for your support! At the time of writing, we are literally in the throes of vintage 2017. I’ve taken advantage of a break between plunging our reds to knock out this newsletter, so hopefully you’ll forgive the odd typo! Relative to the last few vintages, where early budburst and hot Spring conditions led to early harvest dates, vintage 2017 commenced in a much more civilised fashion. Though we were spared the early disease pressure common to most Hunter vintages, with scorching hot days throughout January, which are now even more prolific in February, I was still a little apprehensive as to how the season would play out. Would our pristine bunches of Semillon avoid sunburn, would the vine canopies hold up, and would the reds get ripe before becoming raisins? Happily, the answers to these questions is “yes!” A walk through the winery at the moment fills your nose with aromas of passionfruit, lime juice and melon, as our Semillons bubble away through fermentation. A taste of these fermenting juices quickly confirms my suspicions as to the potential quality of this vintage. I can’t remember a year where so much generosity of flavour (on par with 2014) is framed by such precise and vibrant acidity on the palate (not unlike 2009 or 2016). It is rare to have a season delivering on both qualities in equal measure! As we are only part-way through the Shiraz harvest, I’m still reluctant to praise the red vintage with as much confidence, though based on early impressions, we may well be looking at one of the great vintages…potentially another 2014, dare I say it? 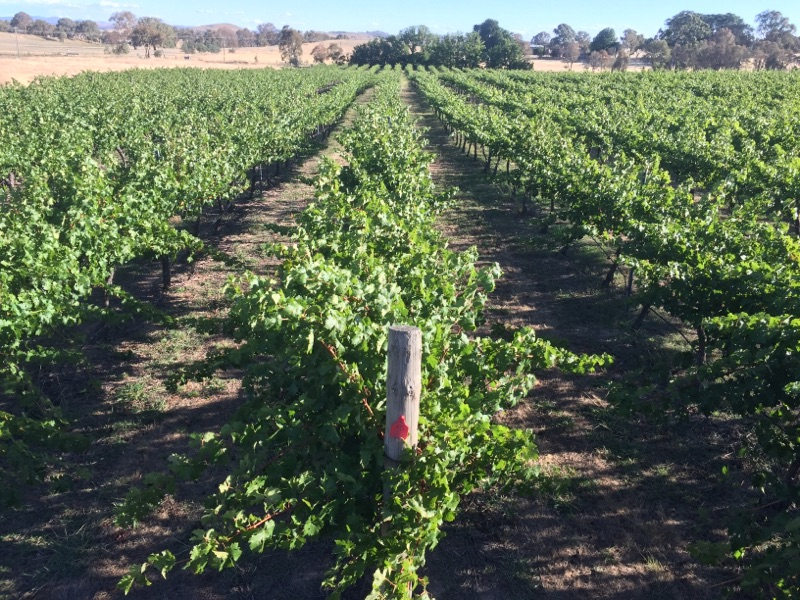 In Canberra and the Hilltops, it’s still very much early days yet, but after a record-wet winter, the vines are boasting healthy and dense canopies which should get them through the hot end to summer. Providing the temperatures settle down heading into Autumn, we should be on track for a cracking season in these areas. A 1970 planting of Shiraz at the Somerset Vineyard in Pokolbin. Modest yields and prime ripening conditions look like delivering one of the great Hunter vintages. Semillon delivered in pristine condition was a recurring theme throughout harvest. Big flavours and bright acidity the hallmarks of vintage 2017. THE GUNDOG ESTATE CORK ST. CELLAR – NOT LONG NOW! Delays in obtaining our new Liquor Licences for our Cork St. Cellar Door in Gundaroo have meant our anticipated opening date has been pushed back to early March. The positive spin-off with the delay is that we’ve had plenty of time to plan, organise, and decorate! The space is coming along brilliantly, and we look forward to welcoming you as soon as possible. We are pleased to announce the appointment of Canberra local Sara Lauer as Cellar Door Manager for the new site. Sara brings a wealth of hospitality, wine sales, and winemaking experience to the position, and we are delighted to welcome her as part of the Gundog team. 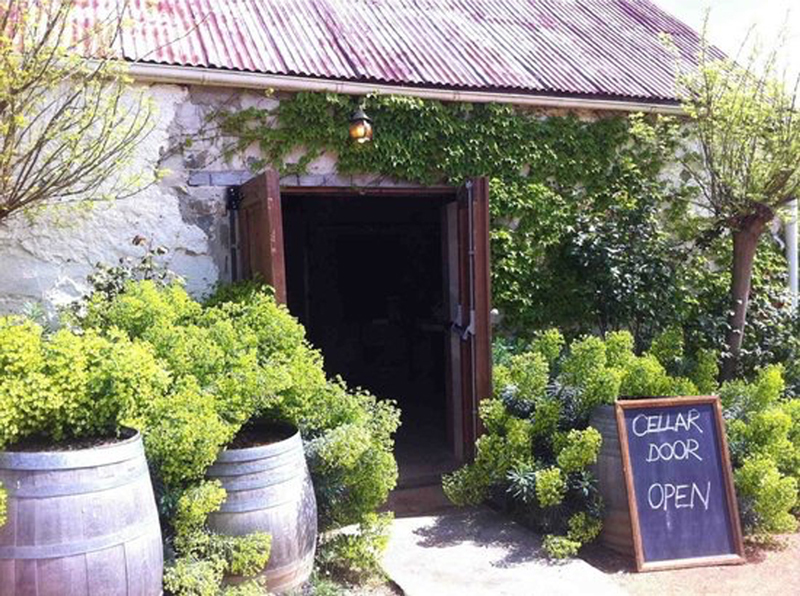 For those unfamiliar with our development, in what will be known as the Gundog Estate Cork St. Cellar, we are moving into the historic stone stables, located in a prime position behind the hugely popular GRAZING restaurant, in Gundaroo village. 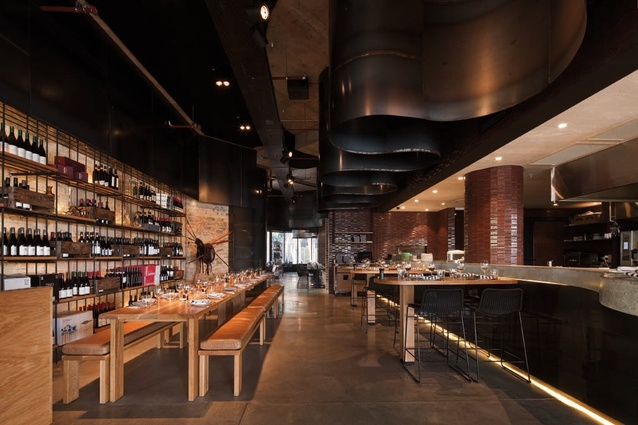 The evocative space is perfect for a cellar door, and until recently was the home of Capital Wines. The owners of GRAZING and the stables, Mark and Jennie Mooney, sold Capital Wines in July, and the cellar door was closed, making this beautiful space available for a new winery tenant. We plan on offering the Gundog Estate, Burton McMahon, and Indomitus ranges, in addition to a selection of locally sourced cheeses and cured meats. For this edition of our E-Newsletter, I am delighted to welcome a very special guest contributor, Scarlett Burton! Aged 7, Scarlett is the eldest of our two Gundog Estate pups (sister to Maddison), and was eager to write a piece about life in the Hunter Valley. Enjoy! 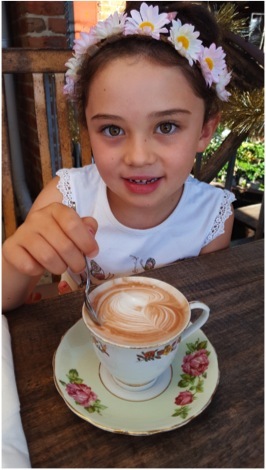 My name is Scarlett and I live with my family in Rothbury, which is next to Pokolbin. Where we live is great for riding bikes and scooters. There are also lots of people to meet. My school is five minutes drive from home, and I am in Year 2. On our drive to school each day, I see my Dad at his winery. Sometimes we stop there on the way home to say hello and to watch Dad make wine. His winery is cool because it has table tennis to play, and a forklift to sit on. When Dad is in the car, all he talks about is the grapevines, and his wine! Sometimes I help my Mum at the Gundog shop, when my sister is at school. I help fill the water jugs and restock the shelves. In the shop, I have a special spot next to Titan the dog statue, where I sometimes eat my snacks. Near the back of the shop, Mum has given me a section for kids to look after. It has hats and activity books. I love all of the restaurants in the Hunter Valley. My favourite is Oishii, which is a very good Japanese restaurant. My Dad orders Sushi there, and me and my sister always get Chicken skewers and rice! Thank you for reading my story about life in the Hunter Valley! In The Chase Semillon, I am looking for absolute precision on the nose and palate, with any secondary ferment or yeast derived characters falling outside the blend criteria. As such, we are taking the concept of free-run juice to near Champagne levels, with only the first 450-550 litres of lightly extracted juice used for this wine (light pressings off to become Wild Semillon components). To protect flavour and aroma later in the wine’s development, we get nearly all of our fining out of the way early; juice is twice racked, fined and settled prior to inoculation with a neutral yeast. Cool fermentation is followed by four months’ maturation on very light yeast lees to carefully build structure without compromising purity. The 2016 release is almost entirely produced from fruit grown at the Somerset Vineyard in Pokolbin. Here, three different blocks were used (30 and 45-year-old plantings), predominately from the sandy soils adjacent to an old creek bed running through the property. In The Chase, we look for a degree of approachability while young (typical of the modern style of Hunter Semillon), in combination with significant potential to age over the medium to long term. The 2016 release has been our most successful yet, landing three gold medals and rave reviews, including a listing amongst James Halliday’s Top 100 Wines for 2016! This style of Semillon pairs beautifully with fresh seafood, particularly Sydney Rock Oysters. 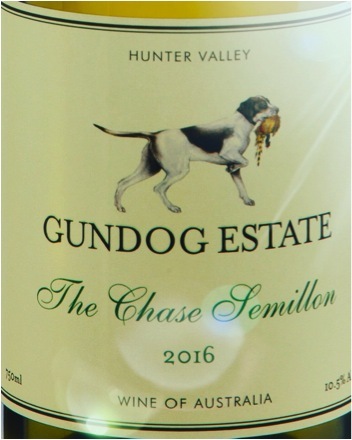 A close relative to The Chase, is our Hunter’s Semillon. While quality focussed winemaking practices are identical, the final outcome in style is notably different. The philosophy behind the Hunter’s Semillon is an evolution in the very concept of modern Semillon. Now more than ever, we understand that the relevant lifespan for a wine is much lower that it perhaps used to be, and the idea of cellaring wine for most of our customers may be of 3-5 years’ duration, rather than 5 to 10 (if at all). Keeping this in mind, we simply seek to deliver a wine of greater flavour and intensity while young. Ideally, this is delivered without compromising precision, regional identity, and most importantly – quality. The separation in style and product arrives purely from the source vineyards. 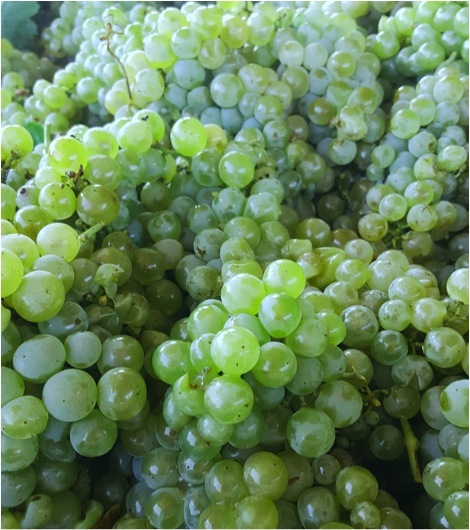 Simply, the Hunter’s Semillon is a product of fruit grown on heavier soils, including the dry-grown Vernon Vineyard on the slopes of Mount View, in addition to blocks planted over red soil at the Tinkler’s and Somerset Vineyards. The result is dramatic in the delivery of bolder aromas and juiciness of flavour across the palate, with composure achieved very early in the life of the wine. Record demand for our Rosé continues, so much so we aren’t entirely convinced we have enough of this year’s wine to meet demand! The unusually hot and dry Canberra vintage meant we harvested our Gundaroo Cabernet Sauvignon (at 12.8 Baume) nearly 3 weeks earlier than usual, with yields below 2 tons per acre. The juice was pressed off skins after 18 hours, settled, and then fermented cool using an aromatic yeast. Reflecting the record warm ripening season, this year’s Rosé is certainly bold! The vibrant hue and aroma suggesting a sweeter style of wine, but true to style we’ve kept the residual sugar low (around 4g/L), allowing the lower pH (3.27) and greater level of tannin to carry the wine into more savoury territory on the palate. The 2015 season played out almost perfectly in Canberra. Moderate summer rainfall was followed by cool, dry conditions, which meant ripening occurred evenly and slowly. As per our Estate Shiraz, the Marksman is produced entirely from fruit grown at the Dahlberg Family Vineyard in Murrumbateman. On delivery to the winery, a combination of whole and crushed berries were cold soaked for three days, followed by a warm fermentation that was allowed to commence naturally, in open top tanks. With three clones of Shiraz to work with, the key points of difference between the Estate Shiraz and Marksman’s largely comes down to the clones used, and the oak regime. Where the 2015 Estate Shiraz was a fairly even blend of SA1654, BRVC12, and Best’s clones, the Marksman’s is based on a blend of 40% BRVC12, and 55% Best’s, with 5% Viognier. The SA1654 afforded the Estate Shiraz a little more generosity whereas, with longer-term ageing potential in mind, we focussed on the more structural characteristics of the other two clones for the Marksman’s blend. Stylistically, this was enhanced through an additional 2 months’ maturation in barrel (14 months in total), with tighter-grained Vallaurine and Mercurey puncheons delivering the 30% new oak component. Only French oak was used across the blend. I see really impressive depth of flavour in the 2015 Shiraz from Canberra, though most excitingly (to my palate at least!) is the tension, brightness, and persistence these wines are showing. Lacking the outright generosity of the warmer 2014 and 2016 vintages, these wines are boasting a magical combination of complexity and depth, with a kind of almost understated sophistication on the palate, which is largely what drew me to the region some 10 years ago. Below is a tentative list of Gundog events for 2017. Most venues are yet to be confirmed, but the dates should be fairly accurate. We are very excited to be hosting our first Hunter Valley winery event, with a dinner in August! Look out for a separate email regarding these events in the coming weeks, once details firm up. an expression of interest so I can hold a spot for you. We look forward to seeing you at one of these locations! As production increases, we are starting to explore exciting new sales and distribution channels. Over the last year or so, this has meant securing two great agents in Sydney; Jake Allan from Garricks Wine, and Jeff Ward from ALE. In addition to these local developments, we’ve also been incredibly fortunate in securing a brilliant distributor in the United Kingdom, Awin Barratt Siegel Wine Agencies. Below is a list of current domestic stockists. Keep in mind, wine lists constantly change, and some outlets may only stock one or two of our wines. If you have any sales leads, either here or abroad, please feel free to email them through to sales@gundogestate.com.au, as we’d love to be in your local bottle shop or restaurant! You can also stay up to date by visiting the STOCKISTS page of our website, http://gundogestate.com.au/stockists. Gundog’s Gundaroo vineyard looks magnificent as it enters veraison, the last of the significant growth stages prior to harvest, which indicators suggest will occur in the later part of March. 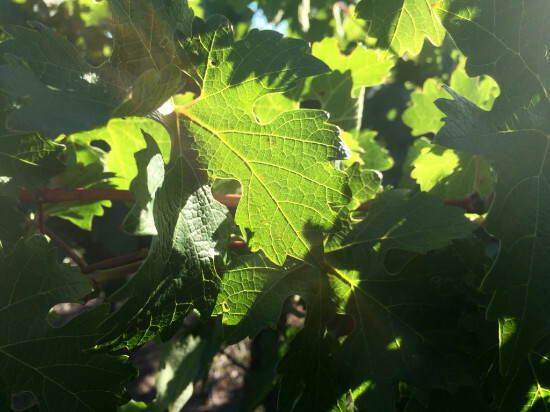 Most striking about the vines this season is the abundance of fulsome deep-green leaf canopy, established early after budburst as a direct result of the very generous winter and spring rainfall which has kept the subsoil the wettest we have experienced. In fact, the total rainfall on the vineyard for 2016 at 987mm has only been exceeded once in the thirty-three years that our neighbours have been keeping records. 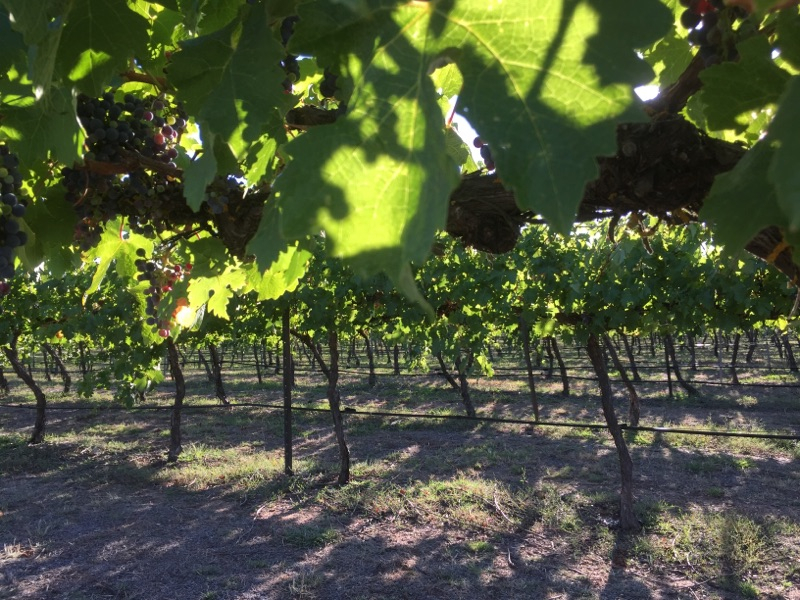 Temperature records have also been broken with several days in the vineyard with the mercury reaching 42 degrees, reflecting extreme state wide heatwave conditions, reaching 47+ in the Hunter Valley, the grape source for many outstanding Gundog wines. In the Canberra region, we are greatly assisted by the large diurnal range. The vines enjoy cool mornings, and the very high temperatures are generally not reached until late afternoon. Although we carefully nurture the vines as though they are family, they are in fact quite sturdy and resilient plants. Most importantly in the month ahead will be the ripening of the berries, the period during which the flavour and character of the wine is determined, and hot sunny days alternating with very cool nights will define our wines’ status within the regions cool-climate terroir. The current vintage will be the tenth since the family purchased the Gundaroo vineyard in the winter of 2006. Timelines and milestones emerge when one looks back, even across a relatively short period, and a great deal has happened with Gundog Estate over the past decade. The 2008 vintage saw the release of a small quantity of Gundog Estate Rosé, our first wine under the new label featuring the gundog and pheasant logo. We entered the wine market with one wine to sell. Cheekily we entered the Rosé in a number of wine shows, garnering a respectable collection of awards including our first trophy. In 2009 we began production of our Estate Shiraz, one of the main drivers behind our plans to pursue a classic cool-climate style of red wine. We decided to use grapes grown by Dane and Kaye Dahlberg in the nearby village of Murrumbateman. 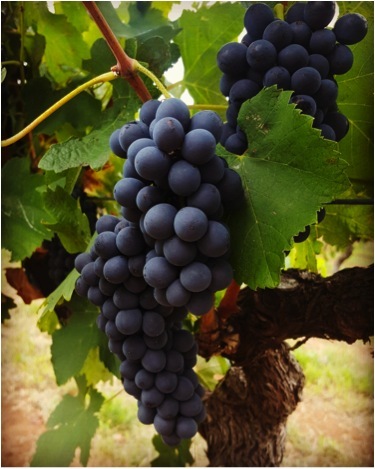 With crops from four select clones of Shiraz the Dahlberg grapes were of a very high standard and provided the flavour Matt was seeking. Gundog Estate 2009 Shiraz was another award-winning release, including its inclusion in the Top Forty Wines in the NSW Wine Awards. We now had two wines to distribute. Our relationship with the Dahlberg family, as growers of our flagship cool-climate Shiraz wines, including the hugely successful Marksman’s Shiraz, continues to this day. 2010 saw Matthew following one of his fine wine passions with the release of our first two Hunter Valley Semillons; the Hunter’s and Poacher’s wines. Naturally the grapes for these wines were sourced from the Hunter Valley, the classic Australian terroir for the cultivation of the Semillon grape. Gundog now had three wines, all of excellent quality, achieving competition and market success. 2011, the fifth anniversary of Gundog Estate, saw the establishment of the Hunter Valley Cellar Door and Gourmet Pantry in the old Pokolbin public school building. This destination in the heart of the traditional Hunter Valley wine country soon became renowned for the wine and the food products for sale and the unique wine tasting experience. The second five years of Gundog Estate’s existence has seen the expansion of the range, quality and style of the wines produced whilst still maintaining our prime interests in the Shiraz and Semillon grapes as can be witnessed on our website. 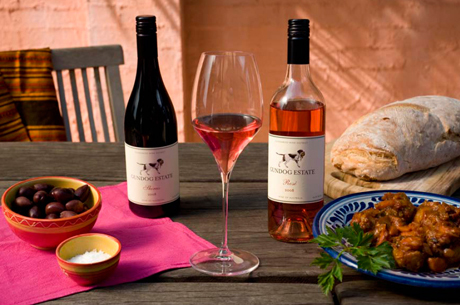 The original Rosé is still produced with fruit from the Gundaroo vineyard and it continues to be a favourite of the range. Gundog Estate’s achievements of the last ten years has been the result of a huge amount of help and support from many people; the growers in both Canberra and Hunter Valley vineyards, our knowledgeable and erudite staff, the amazing and devoted members of the Gundog Estate Cellar Club and the wine writers and critics who continue to find Gundog Estate wines worth talking about. All these resources however would amount to nought were it not for the winemaking skills and creativity of winemaker Matt Burton, and the exemplary management of all aspects of the company’s business by Matt’s partner Renee Burton. Where are we at the end of the ten-year-plan? Well, as many already know we are about to open a new Cellar Door in the village of Gundaroo, geographically the heart of the official Canberra Wine Region, 25 minutes from the city centre and 5 minutes from our original Gundaroo vineyard. The Gundog Estate Cork St. Cellar will provide a new and appreciated amenity for Gundaroo area residents, an easily accessed resource for Canberra wine lovers and a wine destination for Cellar Club members and tourists. Driving from Sydney to Canberra Gundaroo provides an ideal starting point for a Canberra Region wine tour. We hope to see you soon! I recall once hearing Chef Tony Bilson, probably Sydney’s most innovative and influential restauranteur through the 1960s to the 1980s, declare that the purpose of good food was to accompany fine wines. It was a generous declaration from a food oriented master and one I have never forgotten. One of today’s greatest pleasures for me is the exploration of quality foods and ingredients and how they can be appreciated and enjoyed in conjunction with Gundog Estate wines. Now there is a bountiful supply of superb produce to be sourced from within the Canberra Region or adjoining districts but this hasn’t always been the case: when the first serious vineyards were being planted here in the early 1970s locals had to go interstate to the Workers Club in Queanbeyan for something reasonable to eat and legally enjoy with a glass of wine. Serendipitously over the past ten years many fine restaurants have opened throughout the region led by a small army of clever young chefs determined to make the most of the fabulous raw materials now available fresh from local sources. Within the village area of Gundaroo, for instance, or a coo-ee call away at most, we have organic vegetable growers, an olive oil producer, eggs from pasture fed chooks, a producer of exotic mushroom varieties, a cider and apple vinegar producer, a sourdough bakery in a tin shed and a wild honey producer. There is nearby a superb smokehouse (producing kangaroo prosciutto), several truffle producers and graziers who have their beef and lamb processed on their properties and packaged for local consumption. It is little wonder that Gundaroo’s fine-dining restaurant, Grazing, under Chef Kurt Neumann, is Canberra’s go-to restaurant for just-out-of-town lunches and dinners. As Grazing adjoins the new Gundog Estate Cork St. Cellar we expect there will be many opportunities over the years ahead for Tony Bilson’s dictum to be tested. Near the village of Michelago, to the south of the ACT, a small farm produces excellent organic garlic some of which is subjected to controlled stable temperature and increased humidity for four weeks producing Black Garlic an ingredient being increasingly used by local chefs and now available in our regular food markets. Black Garlic was first produced in Korea, traditionally strong believers in the health qualities of this wonderful plant, and is now widely used by chefs around the world. 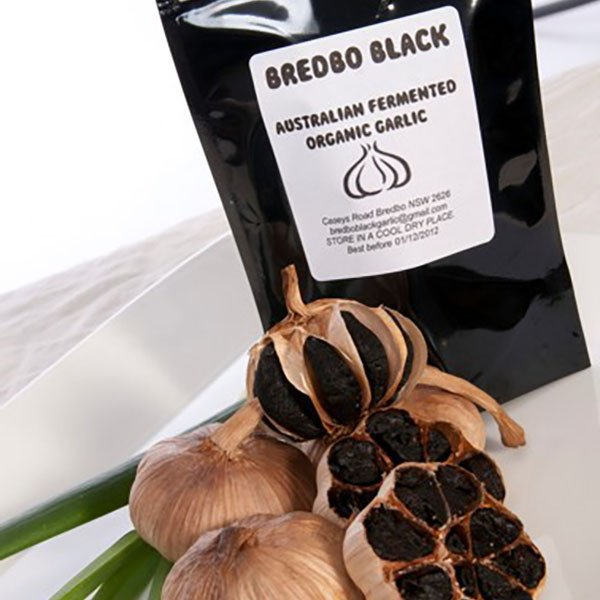 The black garlic curing process is often wrongly referred to as fermentation but as there is no microbial action is more accurately described as having a caramelizing effect, that is, a Maillard reaction. Whatever, it tastes delicious and does wonderful things to the food you cook with it! Like the region’s other great gourmet additive, the mighty truffle, Black Garlic can be finely sliced or chopped and stirred through pastas and rice dishes, served with cheeses, pureed and smeared onto cooked meats and so on. It has a soft chewey texture with taste notes of balsamic vinegar, liquorice, tamarind, and a slight sweetness. Heat oil and butter in frying pan and fry shallots until tender. Add mushrooms and black garlic and fry gently for a few minutes. Add fresh thyme and red wine and cook until most liquid gone. Cook the steaks to your liking and serve on bed of mushrooms. Wash kale and strip leaves from stalks and roughly chop leaving moist for cooking. Finely slice fresh garlic and chilli. Gently sauté garlic, chilli and anchovy in olive oil until slightly coloured. Add red wine and chicken stock. Add kale and wilt but do not overcook. Remove kale and reduce remaining liquid to approximately three tablespoons, pour to flavour kale and serve immediately. Place the port and red wine into a small saucepan, add the eschallots and black garlic and cook over a medium heat until the liquid is reduced by three quarters. Lower the heat and stir through the double cream. Pour over plated meats or serve in a sauce tureen. Don’t forget, the best way to keep up-to-date with Gundog happenings is by following or liking us on social media.